BOSSIER CITY – Make it seven state titles in eight years for Brother Martin. 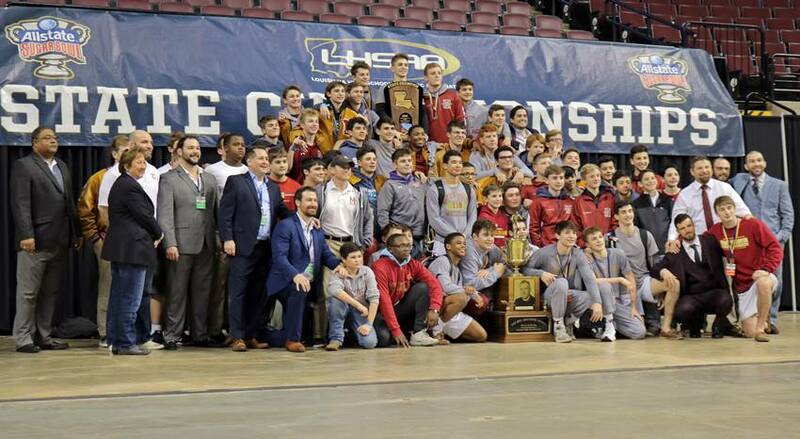 The Crusader dynasty continued Saturday at CenturyLink Center as Brother Martin claimed another state title in the Allstate Sugar Bowl LHSAA State Wrestling championships Saturday evening, finishing 25 points ahead of rival Holy Cross for the title. The title is the 19th state championship for Brother Martin and the 10th overall for head coach Robbie Dauterive. The momentum for Brother Martin began in the semifinals when the Crusaders won nine of 12 matches to advance those nine wrestlers into the finals which include 14 weight classes. In the finals, Logan Bertot (120), Daniel Croy (132), Alex Duncan (138), Patrick Evans (145) and Mason Massicot (160) all claimed titles. Bertot won 10-4 over Luke Romano of Catholic of Baton Rouge, Croy defeated Peyton Ward of St. Paul’s 14-5 for his third straight state title, becoming just the fourth wrestler in school history to capture three championships. Duncan edged Dyllon Bernard of Comeaux 6-4, Evans claimed his second straight state championship with a 7-1 win over Ben Davidson of St. Paul’s and Massicot pinned Allen Mire of Hahnville in 1:32. The story for Holy Cross was the family affair of the Frost brothers. Freshmen Evan (106) and Jacob (113) claimed state titles before older brother Cameron, a senior, finished the trifecta at 170 pounds. It was the first time that three brothers all reached finals in the same season and the first time that a trio of brothers captured state titles, an amazing accomplishment. 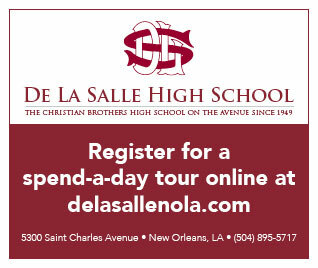 Evan downed Sam Dreuil of Jesuit 7-3, Jacob shutout Hunter Goodson of Catholic of Baton Rouge 5-0 and Cameron beat Hunter Hawkins of St. Amant 8-4. Caden Mumme (182) gave the Tigers a fourth state championship winner with a 6-3 victory over Caleb Mickelson of Zachary. Perry Ganci of Jesuit won a thrilling match against Mack Brown of Brother Martin in the Division I title match at 285 pounds. Ganci recovered from a 5-2 deficit and pinned Brown at the 5:32 mark in a battle of defending state champions. It was the third consecutive individual state title for Ganci. who signed a football scholarship with Nicholls last Wednesday. Ganci became the ninth wrestler in Jesuit history to win three individual state titles. Luke Eccles gave Jesuit a second state champion, whipping Peyton Bass of Airline 10-2 at 126 pounds. Cole Ulfers of St. Paul’s won the state title at 195 pounds. Ulfers defeated Devon Clark of East Ascension 9-4. Jesuit finished third with Catholic of Baton Rouge fourth and St. Paul’s fifth. Hometown Parkway of Bossier City claimed its second consecutive Division II state championship and ended a five-year run by Teurlings Catholic as state champions. The two had tied for the title a year ago. Parkway won by a solid 46 points with the Rebels finishing second. It is the fourth state title for the Panthers overall, with all coming since 2003. Individual winners for Parkway included Trey Fontenot (120), Darryl Nicholas (126) and Connor Cloinger (220). North DeSoto finished third with Live Oak fourth and Archbishop Rummel fifth. Glenn Price of Archbishop Shaw (106) defeated Joshua Keeler of Parkway 8-6 to win at 106 pounds. In Division III, Basile claimed its second state championship in school history and its first since 1991, running away with the title by 57.5 points over defending champion St. Louis Catholic. Brusly was third with Archbishop Hannan fourth and Church Point finished fifth. Individual winners for Basile included Alex Menier (113), Blake Menier (126), Gavin Christ (145), Logan David (170) and Isaac Cortez (182). The Most Outstanding Wrestlers included Cole Ulfers of St. Paul’s (195 pounds) in Division I, Morgan Manuel of Rayne (145) in Division II and Gavin Christ of Basile (145) in Division III. Looking ahead, the tournament completed its third straight year in Bossier City and fourth overall at CenturyLink Center since 2011. The wrestling contract is up and will require a bid process to determine where it will be in 2020. There is a new committee set up to try to help with the process and the possibility of the event returning to south Louisiana next year is substantive.